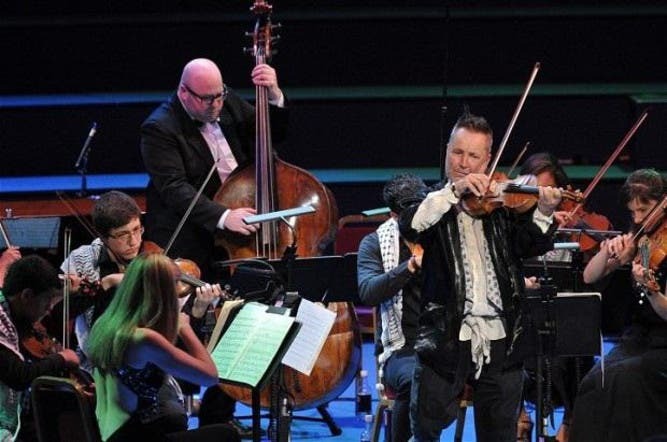 The BBC is due to cut comments made by violinist Nigel Kennedy about “apartheid” in Israel when it broadcasts his concert, performed with Palestinian artists as part of the Proms musical festival, on British television channels next week. The concert, held at London’s Royal Albert Hall last week, featured 17 musicians from the Palestine Strings, the troupe performed Vivaldi’s Four Seasons alongside Kennedy. Kennedy likened the situation in Israel to apartheid in South Africa. “Ladies and gentlemen, it’s a bit facile to say it but we all know from experiencing this night of music tonight that giving equality and getting rid of apartheid means there's a chance for amazing things to happen," said Kennedy. The decision to cut Kennedy’s comment was made due to “editorial reasons,” they removed because of “the way it fitted in with the program, ” a BBC spokesperson told Al Arabiya English. Kennedy has previously refused to play concerts in Israel, but has participated in the Palestinian-run Jerusalem Festival in East Jerusalem. In 2007 he told the Israeli newspaper Haaretz: “It’s no coincidence. I became aware of the Palestinian story while I was a student in New York. My girlfriend then was Palestinian, and, through her, I began to familiarize myself with and understand the problem even before the [separation] wall and the other atrocities. “She had to return home every year or she would lose her citizenship, and, like it was for all of us students, that wasn't exactly her thing. Then I understood that it was simply a way to harass the Palestinians and prevent them from studying,” he added. Kennedy dedicated his performance at the Proms to Palestinians, according to his introduction. “The concert tonight is very emotional, because I am performing for people who are imprisoned, to give them two hours of fun and show them that the world has not forgotten about them,” he said. Dressed in popular Palestinian garments, the players from the Palestinian orchestra played a specially-curated fusion of classical work with Arab and folk music alongside the celebrated violinist. Can Dubai’s music scene hit the right notes?